If East Germany was the pivotal case in what subsequently became a wave that engulfed all of Eastern Europe and significant portions of the Soviet Union as well, in the postcommunist era and in the context of hybrid, rather than communist regimes, Serbia played the same role in the spread of the color revolutions. Oppositions had succeeded through extraordinarily ambitious electoral efforts to wrest power from authoritarian leaders in Slovakia in 1998 and Croatia in 2000, and these efforts were closely connected to one another through the operation of a transnational network that provided the resources needed to launch unusually strong opposition bids for power. However, like Hungary and Poland during communism, these early challenges to authoritarian rule in the postcommunist world also took place in regimes that were by regional standards unusually vulnerable to such actions as a result, for example, of large and ripened oppositions confronting regimes that were less repressive than many of their neighbors. The subsequent and much more surprising defeat of Milosevic in Serbia in the fall 2000 elections, however, proved to be, like the protests in East Germany eleven years earlier, a turning point in the diffusion process. Indeed, the reasons why these two countries were able to join the diffusion dynamic and thereby transform a process of modest cross-national transfer of innovative challenges to authoritarian rule into a much more ambitious one in a geographical sense were the same. Like East Germany, Serbia featured for a variety of reasons too complex to detail here the unusual combination of a relatively large and developed opposition facing off against a relatively hard-line regime. What made mobilizations against authoritarian rule in these two countries so critical for the subsequent magnification of each of these waves? One factor was that they demonstrated the portability of the innovation and the fact that popular mobilizations against authoritarian rule could work in far less supportive local contexts. Here, it is important to note that both East Germany and Serbia were governed by long-serving authoritarian political leaders who had important international allies and who were therefore in a position, far more than the early risers in their respective waves, to test the geographical limits of popular protests and the new, unorthodox and therefore not fully credible commitments of powerful international actors in the region, such as the Soviet Union in 1989 and the United States in the color revolutions. Moreover, these two states, again in contrast to the early risers, were powerful states within the region because of their geopolitical importance. At the same time, these pivotal states were more similar in their political economies to many other states in the region than was the case for the early risers. In addition, it was in these cases that the innovation was modified and became, as a result, more easily transportable to other countries in the region. Thus, East Germany showed that protests could propel regime change (thereby breaking with the roundtable model used in Hungary and Poland), and Serbia later demonstrated that the electoral victories of the opposition could lead to regime change in more repressive political settings if post-election protests were added to the opposition’s toolkit. As a result, what might have been a fluke from a regional vantage point—that is, the roundtables in Poland and Hungary and the electoral transitions in Slovakia and Croatia—were transformed because of pivotal cases that lead to the start of a much more far-reaching wave. The Tunisian protests, which began with the self-immolation of a street vendor, prompted several similar actions in other countries, as well as the eruption of small-scale protests in neighboring countries, such as Algeria and Libya. In fact, many of the same regional factors that propelled the European and Eurasian waves were also present in the MENA—for example, striking similarities among political and economic regimes in the region, a common language, and the presence of a large number of long-serving and very corrupt leaders (some of whom, at the time the wave began, were in the process of positioning their sons to be their successors). Also similar was the role of powerful international actors, such as the United States in the case of the MENA, in pursuing a two-track policy by combining long-term support for authoritarian incumbents with expanded democracy assistance and increased pressures on some of those leaders to introduce liberalizing reforms. At the same time, while Tunisia was widely viewed within the region as an atypical country, which worked against the transmission of its precedent, it was also unusually influential because protests had managed to take place and even succeed in such an authoritarian context. While these factors no doubt readied publics in the region to emulate the Tunisian model of removing authoritarian leaders from office, another factor played a more significant role in broadcasting the protest dynamic; that is, the eruption of large-scale and sophisticated demonstrations in the capital of Egypt. Egypt was, in fact, a logical country to follow in the immediate footsteps of Tunisia, in part because these two countries had so much in common. For example, cases both share membership in the Arab Socialist movement and a long history of centralized, fused and corporatist political economies. Moreover, both countries experienced a shift in the 1970s and 1980s to a more liberalized economic system (which prompted popular protests in both countries), and their leaders carried out some short-lived and largely half-hearted experiments with political liberalization. In addition, like Tunisia but unusual for countries within the MENA, Egypt had well-established state borders, a strong national identity, and a relatively homogeneous population in ethnic and religious terms. Finally, Egypt, far more than Tunisia and, indeed, virtually every other country in the MENA, had a rich history of political protests and strikes (especially in the few years leading up to 2011) and an unusually large civil society and strong labor movement. Egypt, therefore, like Serbia and East Germany, featured the unusual mixture of a well-developed opposition confronting a highly repressive regime. Like East Germany in 1989 and Serbia in 2000, Egypt contributed three key developments that made a possible wave much more likely to become a real one. First, without Egyptian participation in the wave, Tunisia would have been a solitary case of a popular uprising that overthrew a dictator. Second, Egypt demonstrated to interested parties throughout the region that the Tunisian precedent could travel and succeed, and, what is more, do so in a country that was far more important in terms of size, more similar to other countries in the region, and unusually close to the most influential international power in the region, the United States. Finally and also like East Germany and Serbia in the two earlier waves, the Egyptian dynamic built upon the model first developed and applied in Tunisia, but amended it in ways that made the Egyptian efforts innovative, successful and easy for others elsewhere to emulate. In particular, while youth played a key role in Egypt as well as Tunisia (as they had in most of the color revolutions) and while they were joined by older or established opposition groups and figures as the protests continued, the eighteen days of Egyptian protests did not start with self-immolation and they targeted, from the beginning, large urban areas (as opposed to rural areas as in Tunisia) and the establishment of control over central squares. Moreover, the protests that took place in Egypt built upon past struggles, such as those waged by the Egyptian Movement for Change (Kifaya), the April 6 Youth Movement, and a large and increasingly active labor movement. Finally, the Egyptian protests were carefully orchestrated to have maximum impact. For example, they chose National Police Day to begin the protests (January 25); gave specific names to major protest days (for example, “Day of Revolt” followed by “Friday of Anger,” with the latter capitalizing on Friday congregational prayers) and used the internet to send out false rumors about the timing and location of the protests. The toolkit that the Egyptian opposition deployed to take on the Mubarak regime had diverse origins, including, for example, a recycling of some of the practices used in the past by the Muslim Brotherhood and a sharing of experiences in dealing with regime repression with the Tunisian opposition. Also critical, as in the case of the Serbian struggle against Milosevic, were innovations introduced by younger members of the Egyptian opposition. For instance, prior to the first protest on January 25, leaders of the younger opposition carried out some experiments. Thus, they held small-scale weekly protests, and they walked through some popular quarters of Cairo, yelling out complaints about the regime, and assessing how angry Egyptians of various backgrounds were with the regime and how willing they were to join the procession. As they discovered through their “fieldwork,” there was considerable potential for a Tunisian-like dynamic in Egypt. This information in turn was fully in line with other indicators of popular dissatisfaction as revealed by the rapid and large-scale response of youth and educated people to messages relayed through Facebook and texting. Thus, while the Egyptian model was influenced by deliberate diffusion and this also enhanced its ability to influence publics in other countries, the more important mechanism of diffusion to other countries seems to have been demonstration effects. Here, a key insight is, first, that the Egyptian protesters succeeded in pressuring their military to remove Mubarak from office. Second, and much like what happened in the case of East Germany in 1989 and Serbia following Milosevic’s refusal to admit electoral defeat, the Egyptian protesters had managed to put together an ensemble of techniques that reduced the costs of protest while accomplishing the goal of removing an authoritarian leader from office. These feats in turn helped people throughout the MENA to overcome fundamental problems of coordination under authoritarianism by helping individuals believe that others would join the process and that, as a result, the personal benefit of joining protests would outweigh the expected personal costs. The value of the “square” model can be seen in a comparison of Egypt and Yemen. In Yemen, a diverse coalition of Islamist and secular opposition groups were also inspired by the Tunisian example and organized mass rallies around the same time that the Egyptian protests began. The Yemeni protests, however, occurred in different locations and lacked a geographic focus. On January 27th, the day Egyptians were planning their coordinated march on Tahrir Square, Yemenis demonstrated in several disparate locations in the capital. Although these fragmented Yemeni protests had led President Saleh by February 2nd to promise to step down in 2013 and not to position his son Ahmed to succeed him, Yemeni protests did not reach a bandwagon until Yemeni protesters emulated Egyptians’ tactics and began a continuous sit-in in a square near Sana’a University on February 20th. By that point, pro-Saleh groups had already occupied Sana’a’s Tahrir Square to prevent anti-Saleh protesters from moving there. What made the transfer of these techniques easier, but what was missing from the European and Eurasian waves, was the fact that citizens throughout the MENA could watch Egyptian protests on satellite television and know that others in their country saw it as well. These reports, moreover, built upon the considerable emphasis that al-Jazeera had placed in its programming over the years on political reforms. The techniques, which were noted earlier, were sufficiently simple that people understood that others understood how something similar could unfold in their own country with similar results. For example, the initial protests in Egypt targeted issues of region-wide concern, such as low wages, police abuses, and the need to lift emergency laws. Students of diffusion have tended to restrict their analysis to one wave, treat its spread as a single process, and identify some general drivers of the dynamic, such as similarities among sites, demonstration effects and deliberate diffusion. Our approach has been different, largely in recognition of the fact that, while protests can erupt in one or several authoritarian regimes in a region, they are unlikely to spread because the remaining regimes in the region are less vulnerable and because their authoritarian leaders learn from threatening precedents and take necessary precautions. This fact of authoritarian life, however, must be placed alongside the demonstrated ability of such profoundly subversive actions to spread at times among regimes within regions, as we have seen in the Arab uprisings and earlier, 1989 and the color revolutions in the communist and postcommunist world. This puzzle led us to compare these three waves with one another and pose one question: why was a likely isolated eruption of protest transformed into a larger regional dynamic? Our answer is that each wave became a wave because of the participation of a key country early in the dynamic: East Germany in 1989, Serbia in the color revolutions, and Egypt with respect to the Arab uprisings. In all three cases, protests moved from vulnerable to less vulnerable regimes, yet regimes that nonetheless featured ripened oppositions. Moreover, these countries were, in comparison with the regimes that had first experienced popular mobilizations against authoritarian rule in their region, more important in geopolitical terms; more similar to other regimes in the region; and in a much better position to demonstrate that powerful external actors were willing to tolerate significant political change. Also critical for transforming “one small revolution,” as Robert Kaplan characterized the Tunisian events on the eve of the outbreak of protests in Egypt, into a much bigger one in geographical terms, were two other features of these cases. In East Germany, Serbia and Egypt, citizens succeeded in bringing down authoritarian leaders, and opposition leaders developed innovative approaches to protest that were easily transportable to many other regimes in the region. In this sense, while waves of protest against authoritarian leaders must start somewhere and this justifies all the attention paid to “early risers,” the likelihood of a larger regional dynamic depends upon a second development: whether key countries in the region join the process. See Donatella della Porta and Sidney Tarrow. “Double Diffusion: The Co-Evolution of Police and Protest Behavior with an Application to Transnational Contention.” Unpublished manuscript, 2010. Valerie Bunce and Sharon Wolchik, Defeating Authoritarian Leaders in Postcommunist Countries (Cambridge: Cambridge University Press, 2011). See, for example, Stephen King, The New Authoritarianism in the Middle East and North Africa. (Bloomington, IN: Indiana University Press, 2009); Bruce K. Rutherford, Egypt after Mubarak: Liberalism, Islam and Democracy in the Arab World. Princeton: Princeton University Press; and Alan Richards and John Waterbury. A Political Economy of the Middle East. (Boulder, CO: Westview Press, 2008). Lisa Anderson, 1987. “The State in the Middle East and North Africa,” Comparative Politics 20 (October 1987): 1-18. Marsha Pripstein Posusney, Labor and the State in Egypt: Workers, Unions and Economic Restructuring, 1952 to 1996. (New York: Columbia University Press, 1997) and Solidarity Center, AFL-CIO, “Justice for All: The Struggle for Workers’ Rights in Egypt: A Report by the Solidarity Center.” February, 2010. Available at http://www.solidaritycenter.org/files/pubs_egypt_wr.pdf. See, for example, Rabab El-Mahdi,Rabab. “Enough: Egypt’s Quest for Democracy.” Comparative Political Studies 42 (February 2009): 1011-1039. David D. Kirkpatrick, “Wired and Shrewd, Young Egyptians Guide Revolt.” New York Times, February 9. Available at nytimes.org/2011/102/10/world/middleeast/10youth.html. and David D. Kirkpatrick and David E. Sanger, “A Tunisian-Egypt Link that shook Arab History,” New York Times, February 14, 2011, A1, A9. Susanne Lohmann, “The Dynamics of Informational Cascades: The Monday Demonstrations in Leipzig, East Germany, 1989-91.” World Politics 47 (October 1994): 42-101 and Timur Kuran, “Now Out of Never: The Element of Surprise in the East European Revolution of 1989,” World Politics 44 (October 1991): 7-48. Marc Lynch, Voices of the New Arab Public: Iraq, Al-Jazeera, and Middle East Politics Today. (New York: Columbia University Press, 2006). ”One Small Revolution.” New York Times, January 23, 2011, p. 11. 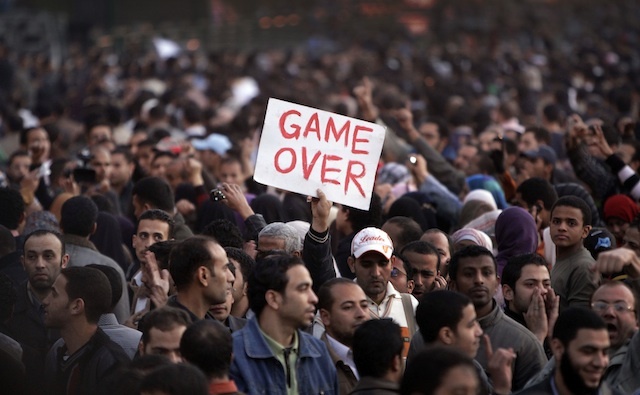 I enjoyed this article and its first stab at understanding an aspect of the Arab Spring. I recently discovered a piece by Kurt Weyland from 2010 that considers, “The Diffusion of Regime Contention in European Democratization, 1830-1940” (http://cps.sagepub.com/content/43/8-9/1148.abstract). While Bunce and Patel focus on a single outcome (diffusion of regime challenges), Weyland is puzzled by variation in the outcome of diffusion (successful replication, preemptive reform, etc.). His article may be a nice complement to the one posted here. Yes, the Arab Spring sent shock waves throughout the Middle East, and Egypt may help explain that; but, why did it affect some countries more than others?